The brief was to design a new wing for the architecture department at TUT. The end user wanted studio space, office space and an auditorium to seat 120 students. The building had to be as energy efficient as possible, without using any mechanical ventilation. The building consists of two wings with a central core, essentially creating two courtyards, one on the West, and one on the East. The two wings are North-South orientated, with large areas of glazing on the northern facades, to maximise natural light as well as solar penetration in winter. During the summer months these are protected by means of horizontal louvers. All the windows on the southern side are double glazed to prevent heat loss in winter as well as to buffer the sound of the road running past the site directly to the South. The two wings are long and thin, with a maximum width of 8m to maximise cross ventilation. 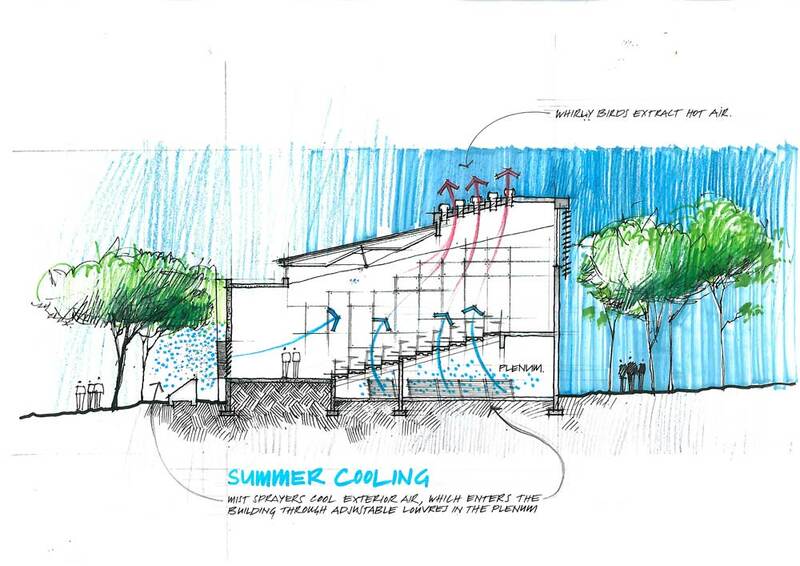 The air on the Southern side of the building will be cooled with mist sprayers, using rainwater harvested from the roof, effectively creating an evaporative cooling system. Photovoltaic cells on the roof generate 7kW of power, which keep backup batteries charged for use during ‘load shedding’. In normal circumstances this power has a dedicated circuit, which runs a few strategic lights and sockets. Solar water collectors on the roof heat water for the heating system, which is essentially a re-invented radiator system. Water from the collectors is circulated through a series of surface mounted water pipes, which in turn heat the space. All the lights are managed and controlled by a KNX system, which works on an infrared movement detection system. When the system picks up movement, it activates the lights, as well as the intensity. This means lights are never on where they don’t have to be. The whole approach to ‘green buildings’ and sustainable design has become a platform for gimmicks and expensive technologies that are not always necessary. 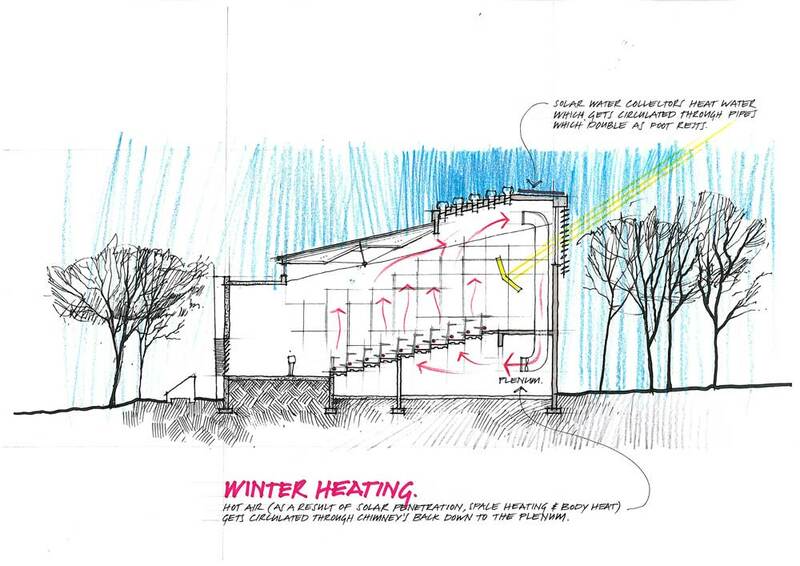 The client wanted a straight forward building, using age old design techniques rather than fancy new age equipment, with minimum maintenance, but maximum adaptability – the building itself is didactic, it is a lab, an experiment that has only just begun.